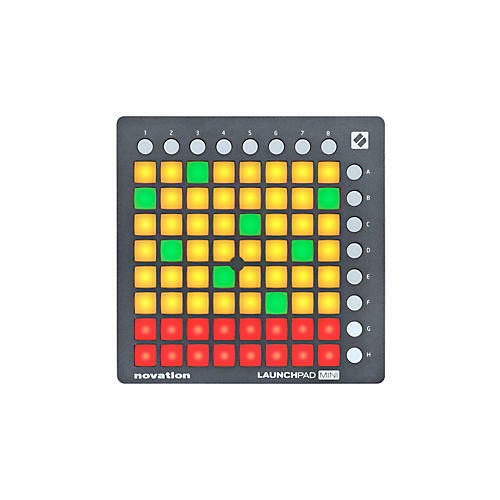 Launchpad Mini is a compact version of the original. It has the same grid of 64 three colour pads for playing loops, samples, and effects in real time. It works together with the Novation Launchpad app for iPad - connect the two together with an Apple Camera Connection Kit (not included) and start making music. The Novation Launchpad iPad app has been designed to get you making music straight away, and it integrates perfectly with Launchpad Mini. It comes with pre-loaded loops and samples that you can use immediately to create unique music, and you can add to them with more professionally produced sound packs as your needs grow. Import and export your own sounds and utilise powerful built-in effects to perform filter sweeps, stutter and drum roll-styled effects and more. Launchpad Mini is part of a family of music-making gear. You can grow your studio with a 'Launch' keyboard or even add knobs to your set up with the Launch Control. They all work together to give you total control over the Novation iPad apps - including the Launchpad iPad app and the Launchkey iPad app, which is a synthesizer with incredible sound shaping abilities. Launchpad Mini offers the same level of integration with Ableton Live as Launchpad and Launchpad S. Trigger clips and scenes, control volumes, sends and more. Your copy of Ableton Live Lite is included. In addition you can get hands-on control of FL Studio 11 with Launchpad Mini's 64-pad grid - and It comes with stickers in the box so you can label the controls.